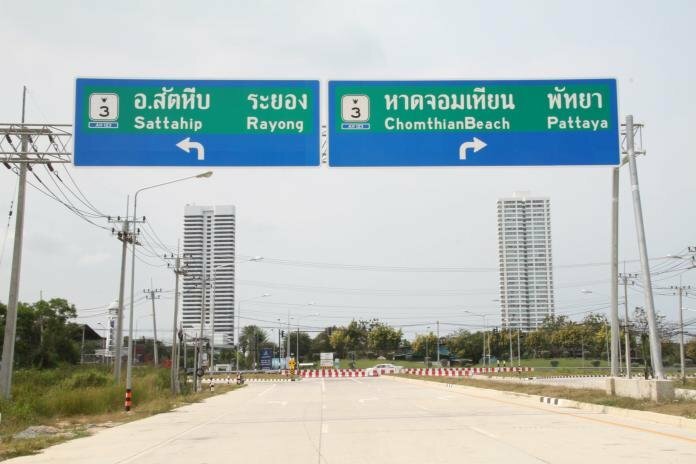 The Pattaya News reported that the Pattaya to Mataphut section of the Bangkok to Ban Chang motorway (Route 7) was now 94% complete. The section that comprises 13 sub-sections is being built at a cost of 14.2 billion baht. It is expected to open by April of next year. They showed a two minute video that showed part of the road along with signage. Haha, love the spelling to the "official" rules. Phatthaya would be over the top. Move around to see most of the new highway, connections etc. Just shows what a bunch of numb nuts they are, there is an interchange that allows you to get off the new highway and go down to that intersection opposite the marina on Sukhumvit Rd shown in the video. Everything from the exit off highway 7 to the interchange is complete, why not just block it off from the interchange onward and force everyone to exit and allow traffic that can bypass Pattaya to do so and collect the revenue from that for the next year, instead of just leaving it sit there, nah that makes sense why would you do that. Why not show a Google map so I can understand completely what/where they are talking about. Have they put the toll booths in place yet? The road was finished 6 months ago, lines painted, lights in place, ready to go. The only thing missing is traffic, what possible reason could there be for any further delay ? Answer - We are in Thailand. There will be some reason ( as with the Pattaya tunnel staying shut because no one had thought to hire or train fire crews ) such as the need to recruit road sweepers, or the road lights are not licenced and this will need a royal decree. What an incredibly pointless video. What possible value has it? The road is of course not seen on standard Google maps. That's why I linked the satellite views in post #3. There are other threads with schematics/plans. Why spend all that money painting all those lines??? Nobody pays any attention to them!!!! !